Recently, two national publications gave Forest Dunes’ The Loop Top New Course honors. Golf Digest named The Loop as the Best New Public Course of 2016 and GOLF Magazine named it the Best New U.S. Course You Can Play. In a state with more than 800 public golf courses, the Tom Weiskopf-designed Forest Dunes (read The GolfBlogger’s Forest Dunes review) is in any conversation about Michigan’s best. That in itself is quite an achievement. It is absolutely one of my three favorite courses in the state, and I like it more each time I play. If Forest Dunes has a failing, though, it is that the course is relatively isolated outside Roscommon, and requires a special trip. On my first journey there, my GPS routed me down a sandy logging trail that would have required towing if I was in any car other than my Subaru (my GPS didn’t know about the newer roads). Forest Dunes has cabins, houses and rooms for guests, but an overnight stay would be sweetened by a second course to play the following day. That “problem” was solved last summer with the soft opening of “The Loop,” a unique new Tom Doak design. Instead of adding just one course, owner Lew Thompson added two with Doak’s reversable layout. With clever routing, bunker placement and — most of all — ingenious tee and green placements, Doak managed to create two courses in a single footprint. The course plays clockwise on one day, and counter-clockwise on the other. Players now have the excuse to stay two nights: Play Forest Dunes, then the Loop Red and the Loop Black. I look forward to returning to The Loop this summer to see how it has all grown in. The design itself is worthy of note. 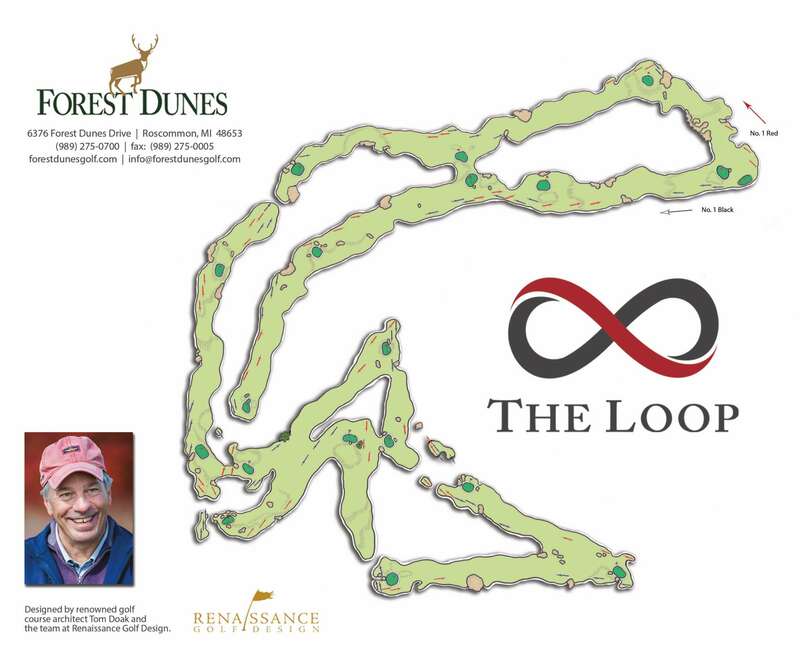 With the same care the crew gives to Forest Dunes, The Loop will be something very special.